"This is a moving and well-written account of how a woman interacts with an injured Canada goose." CHARLOTTE -- The Carolina Waterfowl Rescue organization has been trying to capture an injured goose in northeast Charlotte, as someone has shot it with a nail gun. That nail is now lodged in the animal’s neck. The organization wishes to remove the nail, but has been having a hard time catching the wounded bird. "It's pretty lucky,” said organization director Jennifer Gordon of the location of the injury. “Because it looks like it's wedged between its trachea and esophagus, which is between the airway and where he would eat. It's hard to tell because it looks like he's eating and he's drinking." Volunteers spent Monday evening trying to catch the goose, doing everything from feeding him so he would come closer, to bothering his mate hoping he would come within range. They left Monday night having been unsuccessful in their attempts. Going home empty handed wasn’t what bothered them most about the evening. Additional volunteers will attempt to capture the goose again on Sunday. 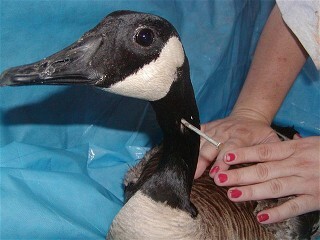 CHARLOTTE, N.C. -- When reports came in of a goose apparently shot with a nail gun, volunteers from Carolina Waterfowl Rescue began trying to find the wounded. The goose lived with several others on a pond near a Retirement Community in North Charlotte. It took weeks to track him down. When volunteers found him, the pictures they took told the story. 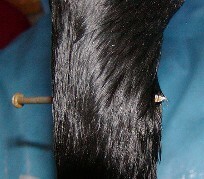 A large nail protruded from the goose’s neck. Workers nicknamed him Brad and immediately began rehabilitation. “Luckily it didn’t go into his windpipe. It kind of went between the esophagus and the windpipe and so he was fortunate in that way,” Epps said. After removing the nail, Epps says volunteers started Brad on antibiotics. Ten days later, he was ready to go. “He’s doing very well. He’s healed and back in top condition,” said Epps. Brad is apparently glad to be home. When crews released him Monday morning, he immediately went toward his long lost mate. The person responsible for Brad’s injury still has not come forward. For the volunteers at Carolina Waterfowl Rescue, they are just glad the animal survived. The group rehabilitates and releases hundreds of injured birds, like Brad the goose, each year. PLEASE CLICK HERE FOR A LOVELY VIDEO OF BRAD'S REUNION WITH HIS MATE. 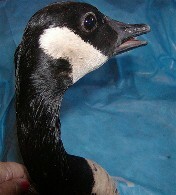 GOOSE WITH UVEITIS, CAUSE UNKNOWN. IT IS BLIND IN ONE EYE. Carolina Waterfowl Rescue goes above and beyond the call of duty to rescue, care for and save the lives of hundreds of ducks, geese and other birds each year. They are always in need of donations to help them continue with the wonderful work they do. Please visit their website for more information.